Those who’ve jumped on board a Paleo diet lifestyle often know very well just how wrong the current popular ideas against saturated fat and cholesterol consumption can be. Some probably wonder though as to how and why something that seems so obvious can be ignored by the major governing bodies and the medical establishment. Such propagation of bogus science can only happen in the presence of strong political and financial interests, as it’s the case with today’s nutritional dogma. The following article will explain just how deep the rabbit hole goes, how governments are killing millions of people with their dietary recommendations and why your doctor is probably wrong about cholesterol, saturated fat and heart disease. Keep in mind that this is a simplified overview and that many more elements have played roles in establishing our current dogma on saturated fat and cholesterol over the years. 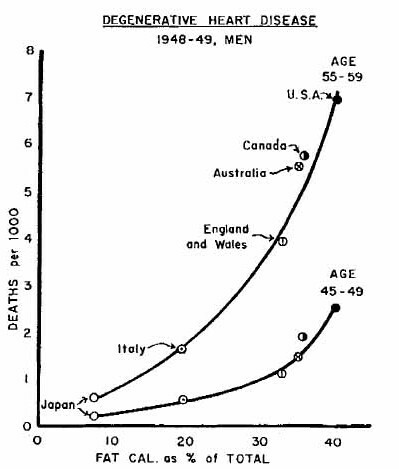 When people think of the origins of the idea that saturated fat and cholesterol consumption give us heart disease, they first think of Ancel Keys and his Seven Countries Study in 1953. While this study is surely the major player in the equation, we have to go back to the 1910s in Russia to get the whole story. At that time in Russia, scientists were interested in studying the effects of serum cholesterol on the formation of atherosclerosis, a type of fatty plaque that forms in the arterial wall that can lead to heart attacks because of a blockage of the artery from a clot or from the plaque itself becoming too thick. It was thought that atherosclerosis was a normal part of aging and that finding ways to slow atherosclerosis formation would also slow aging. It’s important to understand that the studies were done to determine whether high serum cholesterol causes atherosclerosis, no matter if the high cholesterol would come from the diet or not. They fed cholesterol to rabbits and saw a remarkable increase in atherosclerosis and heart attacks. They also saw that feeding rabbits with cholesterol-free fat, like sunflower oil, didn’t cause atherosclerosis. 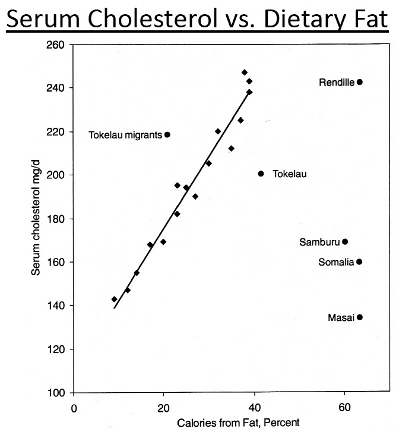 Of course, the major flaw in such studies is that rabbits are a very bad model to study the formation of atherosclerosis in humans as related to cholesterol because rabbits are obligate herbivores and they usually get no cholesterol whatsoever in their diet. It goes to prove, once again, that feeding species a diet for which they are not adapted is calling for trouble. The resulting hypothesis emerging from these studies, which we now call the lipid hypothesis, was greatly controversial and contested. Epidemiological and observational studies cannot be used to properly demonstrate that a phenomenon is caused by a specific variable. There can always be confounding variables that change the results. For example, in the countries where the heart disease rate as well as saturated fat consumption is high, other variables like smoking, unclean water, air pollution, lifestyle and activity levels can affect the rate of heart disease as well. Epidemiological and observational studies are good, at best, to formulate a hypothesis that then needs to be studied in a controlled environment. 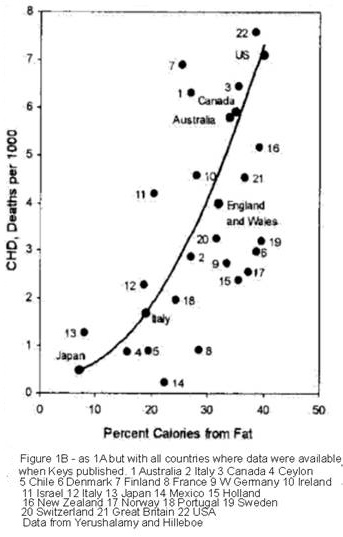 In this new graph you can see that no correlation whatsoever can apparently be made between heart disease and saturated fat consumption. People from some countries, like France and Holland, have a high saturated fat consumption and have very little incidence of heart disease, yet people from countries like Finland and Australia have a lower saturated fat intake and a very high incidence of heart disease. 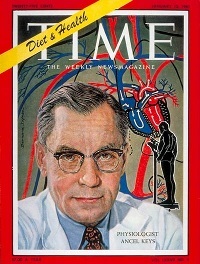 The problem with the conclusions is that the lipid hypothesis by the Russian scientists didn’t prove that dietary cholesterol causes heart disease in humans, yet Ancel Keys took the leap of faith that it does and extrapolated from there to show that eating a high saturated fat diet would increase serum cholesterol and consequently heart disease. These studies were the birth of what we call today the diet-heart hypothesis, in contrast to the previous lipid hypothesis. Lipid hypothesis: High cholesterol in the blood causes heart disease. Diet-heart hypothesis: High saturated fat consumption causes high cholesterol in the blood which causes heart disease. Ancel Key’s findings weren’t universally accepted and were even widely criticized by some, even the American Heart Association (AHA) itself. In 1957, the consensus of the board from the AHA was that controlled studies needed to be done in order to prove that saturated fat and cholesterol consumption is correlated with heart disease and that increasing the consumption of polyunsaturated seed oils would reduce the incidence of heart disease. In 1961, the AHA suddenly had a change of heart, so to speak, and recommended reducing saturated fat and cholesterol intake from foods such as butter, fatty meat, egg yolks and full-fat milk and replacing them with low fat equivalents and seed oils. What changed between 1957 and 1961? Was there any controlled trial done to prove the diet-heart hypothesis? The short answer is “no”. A large scale study was initiated, but was terminated early because of a “lack of funding”. The only thing that really changed between 1957 and 1961 is that some people were dropped from the AHA’s board and some were added, including Ancel Keys himself. Keys was also featured for his findings on the cover of the Times magazine that same year. From this point on, the AHA started recommending what they call the prudent diet; low in total fat, especially saturated fat and cholesterol, and high in carbohydrates from grains and in polyunsaturated seed oils. 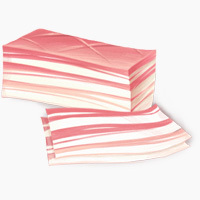 Saturated fat and cholesterol slowly started to gain a bad reputation over the following years, but it wasn’t until several years later that the final nail in the coffin was added and the same dietary nonsense recommended to the general population. 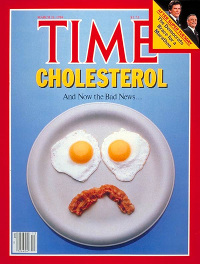 In 1984, reporting on a trial finally done on the relation between dietary cholesterol, serum cholesterol and heart disease, Time magazine published a shocking front page article proclaiming that the diet-heart hypothesis had finally been proven and that the AHA was right all along. You probably even remember the famous cover of this magazine with a frowning face made with eggs and bacon. The article proclaimed that our relation with food would never be the same. This article took the world by storm and is at the birth of the general negative ideas against dietary cholesterol and saturated fat. What that article failed to mention though is that there was another study done that exact same year that showed that while it could be true that a generally high serum level of cholesterol correlates somewhat with heart disease, it’s only oxidized cholesterol that wreaks havoc. High-levels of non-oxidized serum cholesterol are not problematic, but protective and essential to life and to all cells. With these last findings, we should therefore be focusing on what oxidizes the cholesterol in the first place. It turns out that the biggest factors contributing to that oxidation are high polyunsaturated fat consumption from seed oils and excess fructose consumption. Those are the exact foods that the AHA and the USDA (United-States Department of Agriculture) have been telling us to eat in order to reduce our consumption of saturated fat and cholesterol. We’ve all been part of a big experiment that has failed miserably. Many financial interests have intermingled in the whole scene throughout the process in such a way that makes it very hard for the real science to shine and opinions to change. Do yourself a big favor and believe only in things that make sense on an anthropological, physiological and evolutionary level all at the same time instead of believing regurgitated nonsense that comes from bogus science and financial interests.